Can you help establish a tagged dataset of medieval art to be used by the iMotion machine learning group to build a sketch-based search engine? As part of a project to extend Red Hen's work on multimodal communication in network news and interpersonal conversation, we have initiated a project to examine multimodal communication in the period before film and television. Our immediate goal is to create a tagged set of late Roman and early Medieval mosaics, murals, paintings, and statues. The iMotion team, based at the University of Basel in Switzerland, will then perform feature extraction on the dataset and create a sketch-based search engine. 1. A woman wearing a crown (and / or enthroned). 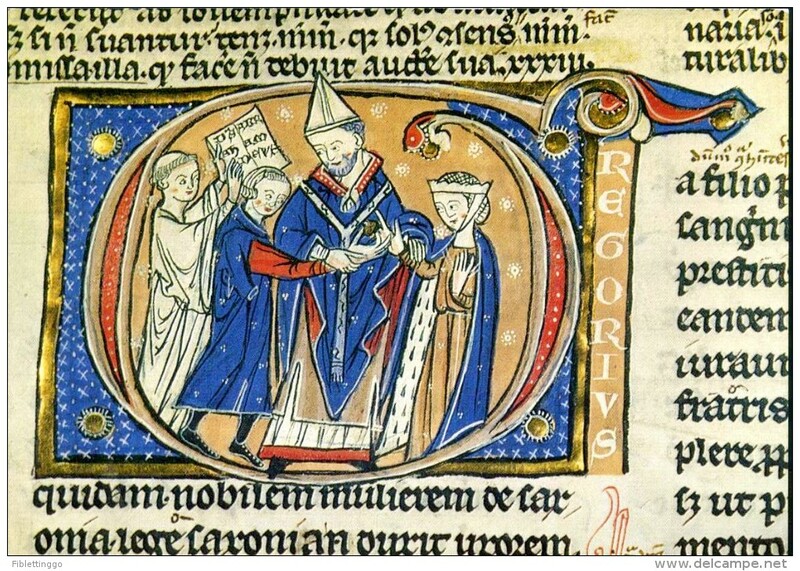 Crowning of the bridal couple was an integral part of the medieval marriage ceremony, at least for first marriages. A woman wearing a crown, especially a turreted crown, taps also into the ancient Greek-Roman tradition of personifying cities as female figures, alluding to the bride of Christ as - in Augustinian terms - the City of God. The principal reading of the bride of Christ as the Church, drawing on nuptial imagery in Song of Songs, Psalm 44, Ephesians 5, Revelation, etc., is reflected in medieval iconography of the Church as a young woman carrying a crown. Also in the medieval period cities were represented as women, as in the thirteenth-century map Peutinger Table (Tabula Peutingeriana) personification of Rome. The bride (left figure) with crown and kissing the bridegroom Christ. Initial 'H'. Crowned bride-Church stands holding a book and making a (speech) gesture. Crowned and enthroned bride-Church holding cross and cup. Church as crowned woman making blessing gesture holding cup. Personification of the Church, crowned and carrying cross and cup. Crowned bride holding cup? and blindfolded synagogue holding book. Christ crucified by the virtues personified as women: Obedience, Mercy, and Humility hammer in the nails, while Charity (crowned) pierces his side with a spear. The crowned bride-Church (lower left - Christ's right) collects the blood that gushes from Christ's side-wound in a cup, while holding a (liturgical) cross. Blindfolded Synagogue (lower right - Christ's left), with a small goat by her side and tablets (i.e. the old law) in her hands, walks away. At the foot of the cross are Adam's skull and bones. The bride of Christ, as the Church, was conflated with the figure of the Virgin Mary. In her aspect as bride of Christ, Mary is envisioned the same age as Christ (the bridegroom), and may appear pregnant. The bride is shown as Virgin Mary (or vice versa: the Virgin Mary is shown as bride) in the apse mosaics of S. Maria in Trastevere. Here, the couple is enthroned and she is wearing a crown, magnificently dressed. Her identification as bride is established by the quote she holds up for the viewer to read, spoken by the bride in the Song of Songs: Leva eius sub apite meo et dextera illius amplexabit[ur] me (Song 2.6: “His left [arm/hand] is under my head and his right [hand/arm] shall embrace me”). Virgin Mary as personification of the Church: seated on a throne and carrying in her right hand a cross and spindles in her left. Her military attire may allude to ecclesia militans / triumphans. The figure is not crowned and carries no overt reference to bridal or nuptial imagery. Again this is the universal Church, personified as bride. For other examples of the bride (sometimes with the bridegroom) inside an initial 'O', see above and below. a. Kissing a male figure (the bridegroom = Christ / Verbum) mouth-to-mouth, typically in Song of Songs commentaries, often in a miniature inside the initial 'O' (Song of Songs 1.1: Osculetur me "Let him kiss me"). Marriage of Jacob and Rachel - Santa Maria Maggiore, from Art in the Christian Tradition, a project of the Vanderbilt Divinity Library, Nashville, TN. http://diglib.library.vanderbilt.edu/act-imagelink.pl?RC=54012 [retrieved February 24, 2016]. Original source: From the library of Lee M. Jefferson. Feudal ceremony of homage where the vassal placed (both) his hands between those of his lord, followed by an oath of fealty. The bride will take the part of vassal, the bridegroom the part of lord.